Let us tell you about the third edition of the ISUtrecht ArtBurst, a true community event where students, staff and parents together celebrate their creativity. The morning was filled with workshops, while the afternoon was bursting with performances and a beautiful visuals arts exhibition. Please view the ISUtrecht YouTube channel for some videos of the day. A warm day greeted ArtBurst 2017 and there was excitement in the air as technology kicked off the art event this year. 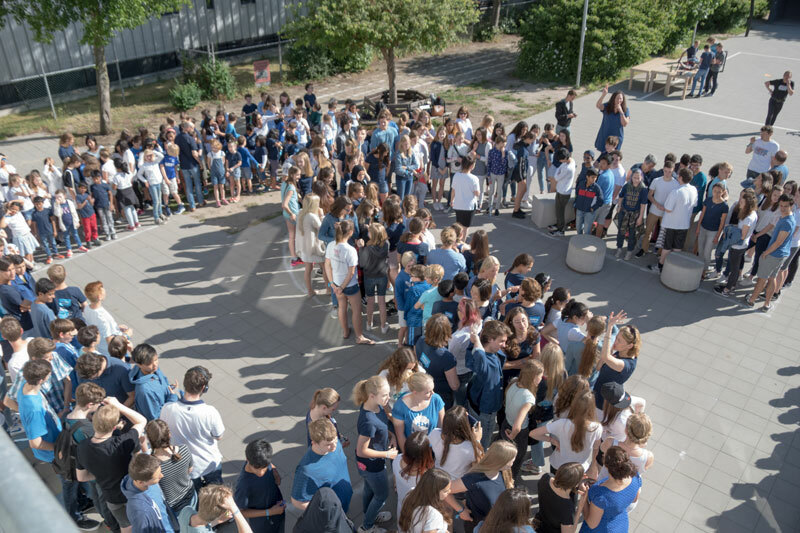 A drone hovered over the important landmark at International School Utrecht to capture the pulse and energy. Students, teachers and staff clad in whites & blues kicked off the festivities by posing in formation to the drone. The morning was filled with a variety of workshops for all students, who danced, sang, created, joined in with capoeira, Zumba, or body percussion sessions, designed their own website, or learned to play the didgeridoo. The doors were open to the parents in the afternoon as events started simultaneously and a high-energy carpeted pulse connected the school buildings in spirit. A crafted creation using popcorn, designs inscribed on wood, a minion craft amongst marvellous paintings and photographs captured the creative and artistic diversity of the ISUtrecht. Captivating songs, piano recitals, theatre performances, dances, demonstrations of Aikido & Judo and a unique Diabolo performance set both the primary and secondary stage on fire. 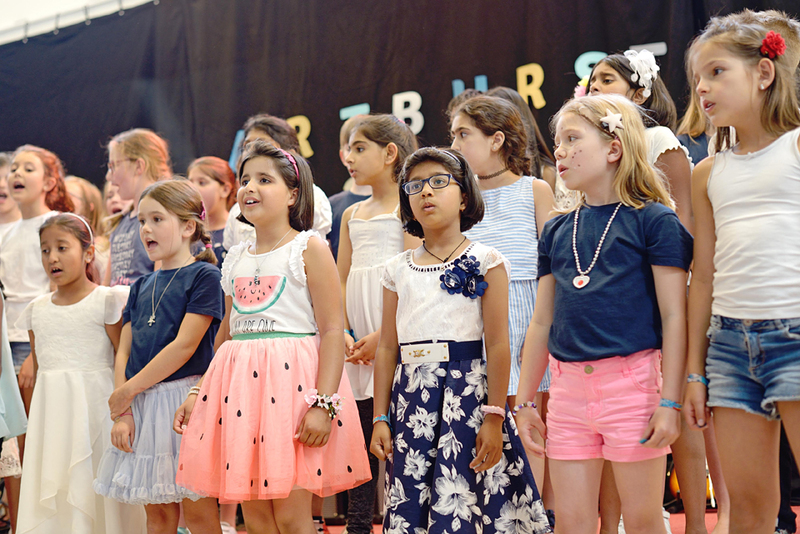 A commendable performance by the primary choir was lead by choir master Mr. De Geus. Guitar presentation by Ms. Opanski’s with students of different ages left us amazed, especially with the unique style of holding their guitars! Cultural diversity at the ISUtrecht was on display at the ArtBurst this year, head of school Ms De Villiers rendered a performance in Afrikaans. Other students and parents too performed songs and dances to showcase cultures from around the world. A fun filled performance by the teachers of the pop hit “Hey” got the audience grooving, while on the small stage a dance performance on a medley of upbeat Bollywood songs by primary parents tempted the audience to shake a leg. The first ever ISUtrecht stage production preview of “A Midsummer musical Night Dream” was performed and this was a proud moment for the Drama Troupe as it is set to hit the stage in November 2017. The Project Charity auction, just like last year, was conducted by Mr. Cox and this year the audience came prepared with their coffers to bid for their favourite refurbished chair. The highest bid went for a chair for a princely sum of 80 euros! A total of over 700 euros was collected and handed over to the Make A Wish Foundation. Thanks to the Parent Support Group, food trucks catered to hungry stomachs and cold drinks were available at both the primary and secondary campus. The ice cream van and bouncy castle at the secondary campus were a hit! All in all a fun day to remember and a BIG thanks to all those who made it such a special one!